“Aphorism” app is a hub where user can find a huge quantity of aphorisms, literary quotes, proverbs, phrases of books and other like this. If the users wants they can share what they like on the social networks like facebook, instagram, whatsapp, email or twitter. Users can search for the aphorisms by entering the keyword or by categories which are defined over application. Users can see the list of the aphorisms from which users can select and can read the respective aphorism over application. Users can select the aphorism and can change the background of the aphorisms and can also apply the filters defined over application; if there is only text then users can change the color of the text and can apply the solid color as the background and once user have done the respective editing then image will get save in the phone gallery over their respective phone. All the aphorism can be added by the admin from the backend over the website, admin will be able to add text then can choose the position of text where he want show over image and then can upload the image when admin will click on the submit button then that image can be created and then will be shown over the application. Aphorism chooses LogicSpice for its extensive experience in the world of web, iPhone application development, thereby provides a better user experience. 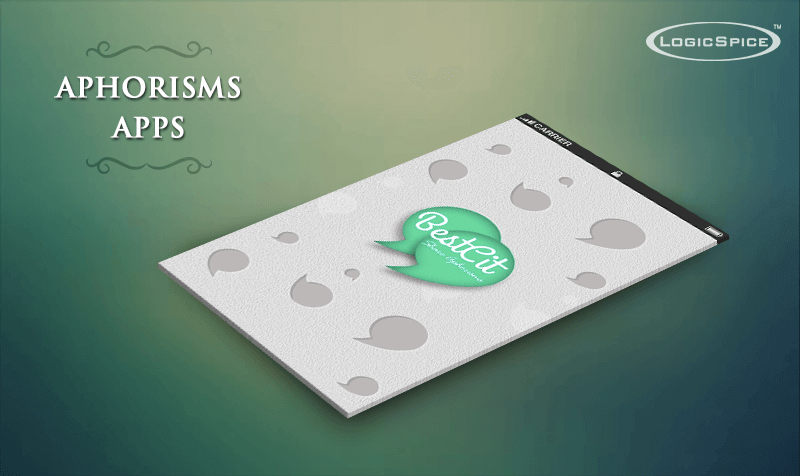 The motto of proposed app solution is that user can get knowledge and get aphorisms as users will be able to search for the aphorisms and then can read it over the application and can change background or can apply filters over the image then can save it in the mobile phone gallery. Our client says "Manish and his team are very professional. We will continue to work with Manish. Great work! thanks a lot!" LogicSpice continues to provide expertise and services in support of Aphorism App ongoing program of application development.